The sundial is paced in a large plaza surrounded with time-posts anchored in a slab of concrete. The plaza and gnomon are supported by pilings embedded to a depth of 6 metres (20 feet) in the ground. The plaza also contains ten time capsules that were created and sealed on the official opening day of Centre 2000. 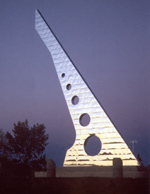 Five of the ten capsules incorporate the sundial, four are dedicated to community sponsorships and recognition, and one celebrates the youth of today and the stars of the future. The first capsule will be opened in the year 2005 recognizing our provinces 100th Anniversary. The remaining capsules will be opened on special anniversaries and predetermined dates, with the final Millennium capsule scheduled to open for the year 2050.